FiiO have been doing a commendable job in updating their DAC & amp line-up to suit a wide variety of user tastes and preferences across all price ranges. Their recent offering, the FiiO K1, is an example of just that which stays true to their original mantra of affordable entry-level offerings. At a price of $39, one could consider it to be the gateway to an audiophile sound and a good one at that. The well-built small device comes complete with a micro-USB going in and headphone output going out. At just 11g, the very small device justifies FiiO’s ultra-portability claim weighing in less than the DragonFly Audio USB and other similarly-priced competitors. 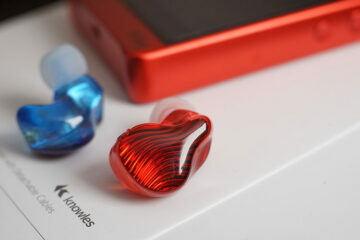 Like the Q1 before it, the K1 comes in a standard box that is half transparent and half red (owing to the accessory box). Unlike the Q1, this packaging appears more professional and consistent with FiiO as a polished brand. It is minimalist and displays all the necessary information without being ostentatious or fussy. Hence, it would not look out of place at an electronic store – much to FiiO’s advantage. The K1 comes complete with a mini USB cable and an instruction manual. 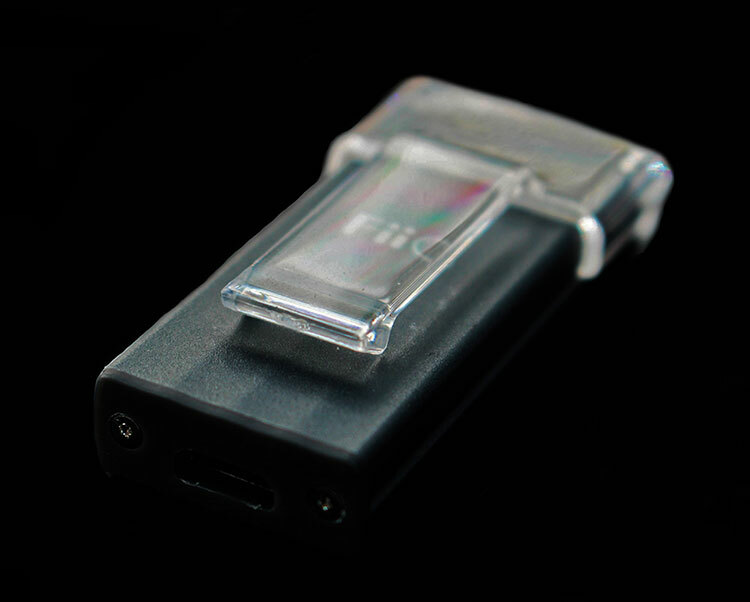 The FiiO K1 is a miniature all-in-one solution in a titanium color shell. Beneath the surface is a transparent removable clip for neat storage and on the go use. The dimensions of the device are 50 x 20.5 x 9 (mm) with the weight coming in at a modest 11g. At the top of the device is a 3.5 mm headphone out with a small blue LED to indicate power. At the bottom, there is a micro-USB port to connect to peripheral electronic devices with USB functionality. Unlike the Q1, there is no bass boost option, nor is there a volume control. Instead the volume can be controlled on a desktop or laptop via the speakers (USB) modality. 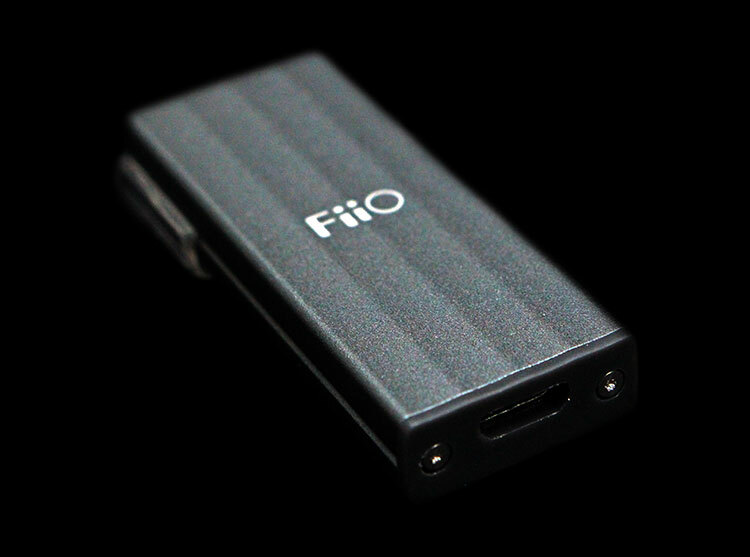 The FiioO K1 utilises the same Texas Instrument PCM5012 DAC chip used in their Q1 model and their previous high-end E17K device (supporting up to 24bit/96kHz). There is a TPA61332A driver and a Savitech’s SA9023A USB receiver to decode USB audio. Not only this but this small device packs a punch with a high output power of up to 75mW. The K1 presents with good detailing and transients with some sparkle in the higher frequencies. Instrument separation and imaging is rather good and is definitely a strong point of this small device. Compared to an on-board sound device, bass picks up more body and texture with moderately decent extension. The midrange itself also increases in body with a smoother and more organic tonality than previously noted. The upper midrange and lower treble is slightly accentuated giving this region of the spectrum some bite and pace. Overall, compared to my standard soundcard, there is a noticeable improvement especially with less sensitive IEMs and headphones. Like the Q1, the K1 presents a detailed and clear sound which is able to drive relatively power-hungry headphones (recommended up to 100 Ohms). However, with sensitive IEMs I have found that the K1 does not present music against a pitch black background. Rather, there is a faint hissing sound that makes tracks have a very slight underlying fuzziness. 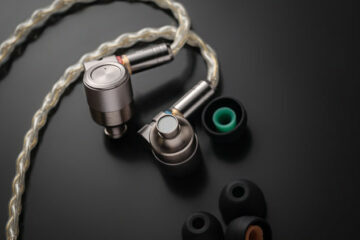 IEMs like the DUNU Titan 3s (tested at 16 ohms) were a prime example of this type of noise. Slightly higher impedance earphones such as the Rock-it Sounds R-50s (at 32 ohms) had a much more reduced amount of background noise. This may detract attention from the audiophile purists who have an extensive collection of sensitive IEMs they plan to pair the K1 with. Perhaps the use of a low-gain switch could have reduced this noise floor rather than having a one-size-fits-all approach. Headphones such as the HiFiMAN HE-400S avoided this problem altogether with tracks being presented against a darker background. I must say I am impressed with this pairing and what this little device is capable of. Instrument separation is decent with good soundstage proportions in the dimensions of width and height. There is sufficient headroom in the HE-400S when driven by the K1 and for that reason the K1 could definitely be used as a desktop amp/dac combo. More power-hungry devices, however, would require an alternate means of obtaining the best out of them. In comparison to Audioquest’s DragonFly v1.2, the K1 falls short in the areas of resolution and contrasting. However the K1 feels easier on the ears as a result of the more honest and reference-approach that the DragonFly strives for. The Topping NX1 amp on the other hand, a more fair comparison to the K1, falls short in the area of soundstage dimension. Treble on the NX1 appears more forthright and consequently harsher than the K1’s moderately extended top-end frequency range. With regards to the sound signature, the K1 is similar to the Q1 with the former having a slightly wider sonic image. The K1 is a touch brighter which becomes even more apparent when the bass option is turned on in the Q1. The Q1, however, is slightly more organic with a better low-end presence. Therefore, the K1 proves to be a decent competitor for its modest $39 price. When pitted against the X7 (rather unfairly), the K1 loses out in layering and detail that makes the former experience much more involving. Rather admirably though, the K1 can compete in soundstage with the X7’s default IEM module. For the price then, the K1 does a very good job at retaining modest levels of detail amongst a good sonic stage. Overall then, the thumb-sized K1 proves to be a decent hitter and entry product in the world of audiophilia. The device is well-built and very convenient with plug and play usability meaning that no drivers are required for installation. The small form factor and lightweight design make the device ultra-portable and aid in this convenience factor. However, I was not able to get the USB OTG functionality to work with my Samsung Galaxy S5 which restricted the use of this device to just a desktop experience. The sound is similar to the FiiO Q1 with good detailing and sonic dimensions. I would definitely recommend it to those on a tight budget. Some recommendations of improvement though, would be to include a volume toggle and gain switch to truly make this an all-in-one device without requiring the interaction of an OS interface. Hi RDX, this is quite an old review and the person who wrote this review is no longer associated with us nor do we have access to these two units anymore, Sorry about that. can u please tell me how to hook FiiO K1 to my home amplifier to play mp3s from my cell phone sony xperia on my home amplifier? I also had problems getting the K1 to work with the Galaxy S5 until I tried a different OTG cable setup. I purchased a Ugreen OTG micro b male to Type A female cable 2 pack from Amazon for about $6. Connected the Ugreen cable to the S5 and attached the K1’s supplied USB cable to that. The K1 now works flawlessly with the S5. I captured the waveform of a reference track I had though the FiiO K1 and compared it to the original reference. I was amazed how similar they were. The frequency response of the K1 is very flat indeed and has my enthusiastic recommendation! Tried connecting thru otg while music app is openned and the sound is distorted. Has is k1 compared to cozoy DAC? I’m using SE215 with this K1. But very unhappy because there is hissing noise in the background. Might be because the 215 has low impedance? How can I remove the hissing sound if I can at all? Sadly I do not think you will be able to as impedance is impedance and I am sure you treasure your SE215 a lot more than the K1. My suggestion is you switch to something with a lower impedance and noise floor than the K1. Searched a bit, think it has to do with Signal to Noise ratio. Gonna return the K1 and find one with lower SNR. Just bought one yesterday. It didn’t work with my LG G4 with USB OTG after unboxing. However, after warming up with my PC for 5 minutes and it then worked with my LG. Anyway, it wouldn’t work with my Samsung Galaxy S2. Any update on the LG G4 performance? What version of Android are you using? Does it work with the stock G4 player? Will this work with an iPhone-6? With the E07k ($69) you just turn off the USB charge and it works with the iPhone. I don’t see what the point of this DAC is unless it works with phones. I do not own an iPhone-6 but some reported it to have worked with an iPhone 6S-plus and several iPad models using a lightning cable to usb adapter. Aside from the OTG functionality (or lackof) I think it’s a good product to improve onboard sound for a relatively cheap price.